When you think of the people and places that help when disaster strikes, you may not immediately think of librarians and libraries. But they can play an important role. Recognizing the untapped potential of libraries, the National Library of Medicine created a Disaster Information Management Research Center (DIMRC) in 2008. The Center is part of the Library’s division of Specialized Information Services (SIS), but the effort involves people throughout NLM and the National Network of Libraries of Medicine. After the earthquake in Haiti, for example, DIMRC quickly put together a Haiti Earthquake Web page filled with links tailored to the people responding to the disaster—including information in Haitian Creole. Information was pumped out on a listserv to a growing number of librarians and health professionals. DIMRC staff gave special guidance to librarians at two university hospitals who were preparing information for their medical teams heading to Haiti. And, the Lister Hill National Center for Biomedical Communications created a Haiti Earthquake People Locator—a Web site to help reunite families—with an iPhone application to submit information to the Web site as well. It was NLM’s first iPhone app. That’s just a sampling of what unfolded throughout NLM in the hours, days, and weeks after the earthquake. But DIMRC is about much more than response. The creation of DIMRC is the latest chapter in NLM’s long history of providing information and resources during disasters. After the gas leak in Bhopal, India in 1984, NLM provided toxicology information. When Hurricane Mitch caused devastation in 1998, NLM joined the Pan American Health Organization (PAHO) to improve the health information infrastructure in Central America. After the September 11 attacks, the NLM National Center for Biotechnology Information devised software to rapidly analyze poor quality DNA samples to help identify victims’ remains. How can hospitals work together and communicate and share information during a major disaster? How can hospitals keep better track of patients during a disaster and help families find their loved ones? 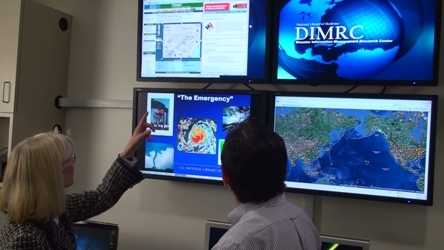 DIMRC is coordinating nearly a dozen research projects to answer those questions. The projects are part the Bethesda Hospitals’ Emergency Preparedness Partnership. The partnership consists of the NLM and three hospitals within a few miles of each other—the National Naval Medical Center, the NIH Clinical Center, and a community hospital, Suburban Hospital Johns Hopkins Medicine. Editor’s note: This is the first in a series of articles exploring the role of libraries and librarians in disasters.